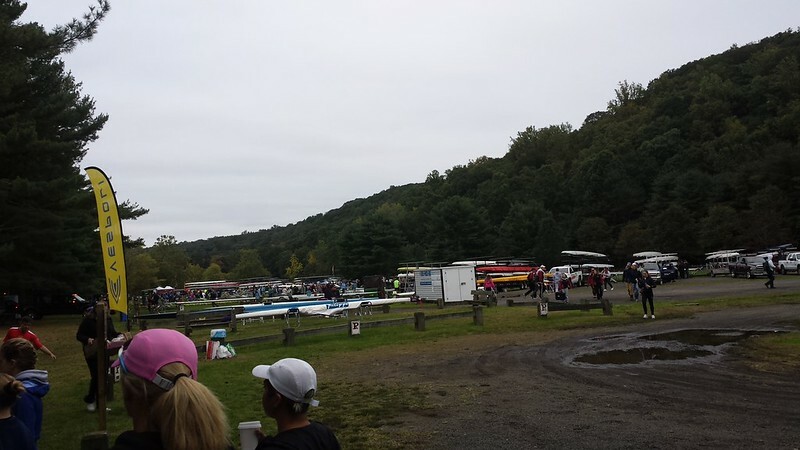 On Saturday we had our first "away" regatta for the fall, down in Connecticut on the Housatonic River. Because of my timing in when I joined the team, I hadn't signed up to race in this regatta when the registration deadline rolled around. But at the last minute one of the rowers who had registered had a family situation come up, so my last-minute name-add got me on the rolls. The host park is about a 2.5 hour drive from Albany, so I wound up getting to have a lovely dinner plus sleepover on Friday night with a teammate whose house is off in the direction of the regatta. It was fantastic to have the chance to get to know A better, and she was an incredible hostess. As with most regattas, we woke up before the crack of dawn, in "dawn's colon," as an acquaintance once put it. 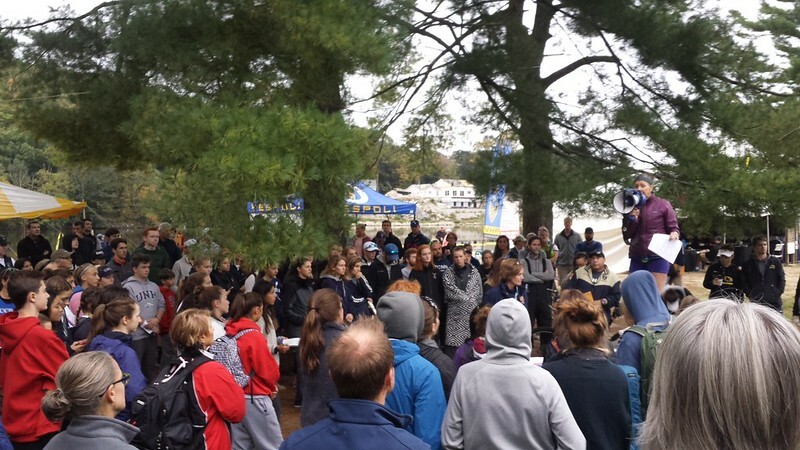 We arrived with ample time to get oriented and listen to the coaches and coxswain's meeting - always helpful when racing on a new course. The weather was perfect: overcast but not raining. There were some puddles and muddy patches out in the fields where teams had their boats all set up, but it wasn't a total mudbath. Our coaches managed to park our boats and trailer right in front of one of the launching beaches, so things were super convenient. My first race of the day was in the 2x, with H. We had a great time, although she kept busy with steering us around other boats. For some reason, we both thought the race length was much shorter than it actually was - she thought 2.5 km, I thought 3 km - so things got extra interesting for us towards the end (lots of "trying to look around with peripheral vision without actually looking"). One way or another we kept at it until we finally heard the finish horn...at the 4.3 km mark. Still: a-plus adventure, will race again anytime. Altogether our raw time would have put us in second place, but after age handicaps factored in, we wound up in 5th place. Meanwhile, the other double from our program edged up to wind up in 2nd. 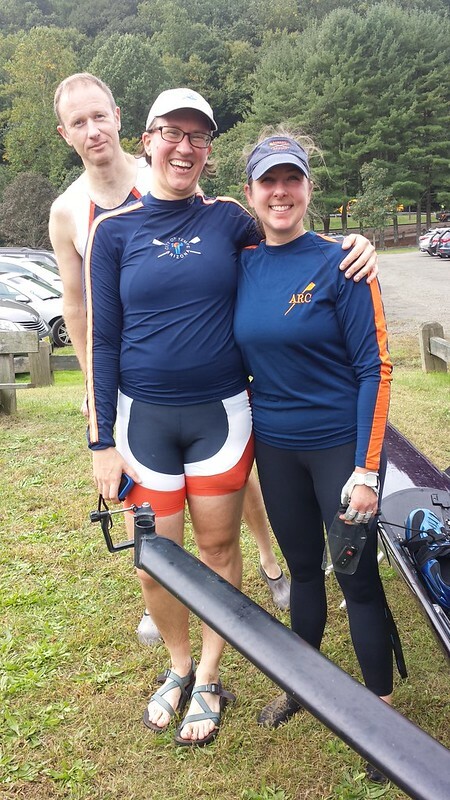 I should nickname the other double the Sweet Double, because both rowers are exceptionally sweet (though still with a healthy competitive streak). Anyway, I think this means that we need to race the Sweet Double head-to-head in practice, starting out with staggered starts based on our respective age handicaps. At the moment H and I basically have a 12-second gap to make up if we want to be able to beat the Sweet Double, age handicap and all. Good motivation to keep getting faster. After the 2x, we had a couple-hour gap and then the Women's Masters 4x. We knew that the 4x was going to be an interesting race well ahead of time, and indeed, it was...eventful. First, our lineup consisted of: myself, Coach A (who is 21 and a beast), Sweet A, and then H in bow again. So we figured we had a chance of being fast. But then, our bow number had us as the very last boat in our event. So we mentally prepared ourselves to have to pass other boats - however many we could. (in addition to mentally preparing for a full 4k this time!). Race time arrived, and indeed, we passed boats - at least 6 of them, if not 7. Unfortunately, not all of the other crews quite knew how to react when being passed, and multiple boats (at least 3!) failed to yield right-of-way to us. That number included another 4x from our own program! So we wound up having to stop 3 times during the race, including clashing oars twice. To make things worse, even though one of the clashes happened literally directly in front of one of the safety launches along the course, the referee in the safety launch apparently didn't see anything. Harumph! We considered protesting, but upon further consideration decided it would be bad juju to protest against another boat from our own program. Besides, since Coach A is only 21 years old, we had to row exhibition anyway - apparently this regatta did not include the Masters AA category for some reason. Meanwhile, Coach A declared that it was the most exciting race she'd ever been in. And I've got to admit, she has a point. It was wild. Our bow seat, H, did a fantastic job under all the pressure, and we raced to our fullest potential. It was also so nice to have time at the regatta to get to know my new teammates better. I probably told a few too many stories about previous rowing adventures, but people took that in stride and we were all happy to be out rowing and racing together during daylight hours. I also discovered that Sweet L is a fellow lucky penny collector. She says the reason that she and A were able to beat us in the 2x race is because she had found a lucky penny in their hotel parking lot that morning. We'll see about that: I picked up a nickel and a penny this morning, so perhaps I can turn tides in my favor now. This entry was originally posted at https://rebeccmeister.dreamwidth.org/1255029.html. Please comment there using OpenID.